In eight hours time the teams will take to the pitch at White Hart Lane to contest the 167th north London derby, a match in recent seasons which has produced a lot of goals and an uncomfortable experience for many a Gooner. I suppose in someways we've come to expect good results from our team in the Arsene Wenger era. We held for such a long time a league record which was unblemished. However in the last few seasons we've shot ourselves in the foot when it's come to getting a positive result in these games. And this season more than any other I can remember, Spurs are actually being talked about as favourites for the game. Any game with Spurs makes me slightly nervous. To take a positive result from the game will be massive. It will mean we've won four on the bounce and will leave us with a positive feeling. Lose and we'll go back to questioning what this season will hold for us. I believe we've got a good chance at winning. We've put a string of results together without playing very convincingly. We've had two periods of 45 minutes (Blackburn first half and Bolton second half) where you can see the real Arsenal fighting to come out. And we gained a good draw in Dortmund where we played with our backs against the wall. It will be our defensive display this afternoon which will either win us or lose us the game. We know we have injury issues there, but it is up to the 11 players on the pitch to perform to the best of their abilities. One thing I'm glad to read this morning is that we've moved away from zonal marking and will line up with each player having responsibility for their own man. Wojciech Szczesny says he prefers zonal market but the manager has made his mind up he wants each defender to have responsibility for their own player. "I really don't mind as long as it works. I personally prefer zonal marking but it is the manager's decision what we are going to do. "We have decided to change it since Blackburn. It really doesn't matter what you do as long as you do it correctly and it works. I think zonal works better for us. We have worked on it during pre-season where we never conceded from a set piece and it looked like it was working. "We did concede a stupid goal at Blackburn [Alex Song's 50th-minute own goal when no defender dealt with a free-kick] and I hope the man-marking will work for us now." It was interesting to hear Thomas Vermaelen talk during pre-season about how hard the team had work to deal with set pieces during the off-season. From what he said it was pretty relentless work. But obviously the manager has seen something in our games already this term to make him change his mind about how he wants us to defend. We didn't quite manage to keep a clean sheet on Wednesday night - the Olympicos goal need I remind you coming from a set piece. But today we've got to build a strong foundation so that we are confident to go and play our game. And that for me starts from the front with Robin van Persie pressing the opposition central defenders whenever they have the ball. We need our work ethic to be high and above all else committed. Szczesny has also said he wants to keep a clean sheet against that bloke who compared himself to Theirry Henry after one good season. The Poland international also believes that form is not the yard stick to judge the game on. "You forget everything that has happened in the past when you go to White Hart Lane. You just focus on the game. It is a huge game but the bigger the game, the more I enjoy it." The only way us Gooners will enjoy the game is when we win it and the referee (Mike Dean) blows up at full time and we've scored more goals than they have. I'm sure the importance of this game has been drummed into the players. They all should know what is at stake. And one player who knows what it's like to have never lost a north London derby is Robert Pires. The Frenchman is still training at London Colney looking for the right opportunity to present itself. And the Arsenal legend has said the last three wins would have lifted this group of players after a rocky start. "Confidence is vital, and it's true that Arsenal have not had a good start to the Premier League. This is a complicated game. But for the team to have won against Bolton and Olympiakos in the build-up to the derby is important." Wouldn't it have been great having a young Pires in the side now? George Graham has been speaking and says that if Arsene Wenger gets this Arsenal side into the top four at the end of the season it will be his greatest ever achievement. We've only played six league games this season and as much as we'd all like to be in the top four already, we've got to fight for it. And by building slowly and adding momentum to our campaign by fighting for wins with a decent mentality, we've got every chance to achieve our aim this season of getting into those Champions League positions. The team news hasn't changed from yesterday. Theo Walcott and Gervinho are to have fitness tests this morning to discover whether they can play or not. I'll preview the team a bit later today. 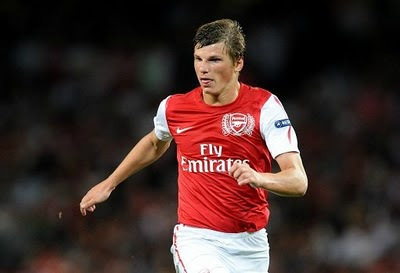 Elsewhere The People claim Andrey Arshavin has been given a pay rise but that his contract - which runs until the summer of 2013 - has not been extended. That seems very strange to me given his current form. The same newspaper link us with a move for 21-year-old Sochaux playmaker Ryad Boudebouz. If you're not going to the game, join us for live interactive text commentary of the game. Set up a reminder below.